Chinatown is perfect for pit stops, places for a quick bite to eat when you are on the go. In fact, many of the restaurants in Chinatown are designed for turning over the tables quickly, maximising the amount of money they can make. That may seem slightly cynical, but I am Chinese and have always been brought up to work hard and earn a good living so I can provide for my family. 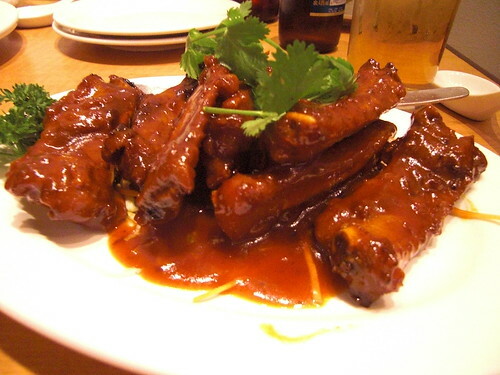 Walking down the streets of Chinatown, roast meat adorn the windows of many of the restaurants, the chinaman's fast food. HK Diner is no exception and is one of the more popular choices, with the added draw of "Bubble tea", cold iced milky tea with tapioca pearls. Even Jun Tanaka rates this as one of his nightime haunts. I normally resist the temptation to order in Chinese. My pronunciation is terrible and it normally ends up in the staff pointing and laughing. My staple order, Roast Duck and Crispy pork. This dish can often end up quite greasy, but the duck and pork were as grease free as can be hoped for, not an oil slick in sight. A smattering of greens and a rather thin gravy but overall, really enjoyed it. I was dining with the Big German so obviously a plate of rice and meat wouldn't suffice so we got some ribs on the side. Sticky, sweet and very messy. HK Diner was pretty good overall and above average compared to the rest of the usual Chinatown haunts. I'm making it my mission to try every roast duck and crispy pork joint and this is well up there at the moment. I had a bit of a shocker when I last went to HK Diner although in fairness my view is based on a bowl of fishball noodles rather than Cantonese BBQ. For your mission, you must try Hung's which is just across the road from HK Diner. Will remember this next time we need a late dinner after a show - thanks! Hung's is amazing! We've been munching our way round Chinatown for a wee while now and have found a couple of goodies and some really unbelievably terrible joints. Just bought a Taste London card so there'll be a fair few dinners out to blog about. Golden Dragon is about halfway down gerrard st and isn't great, isn't bad either. It's clean and big and the staff are friendly but their dim sum menu is really limited. We were there on Saturday and at the table next to us there was an old woman with a daughter and her British boyfriend. Happily picking my teeth with a chicken claw I was disturbed to hear shrieking coming from the table behind. The old woman had jumped out of her seat and was screaming at the waiter, who hadn't a clue. She was shouting at him about how rude her was and how dare he stare at her and so on. Kat was eves dropping and managed to pick up that the waiter was actually her some whom she hadn't seen for years. Obviously some serious sit down time required there. Luckily for the woman she got her meal for free. We didn't however and I'm not sure my ear drums will recover. OK, I'm now thinking duck rice for breakfast 'cause that looks good. You didn't mention that HK Diner is also one of the few Chinese restaurants open till very late at night. 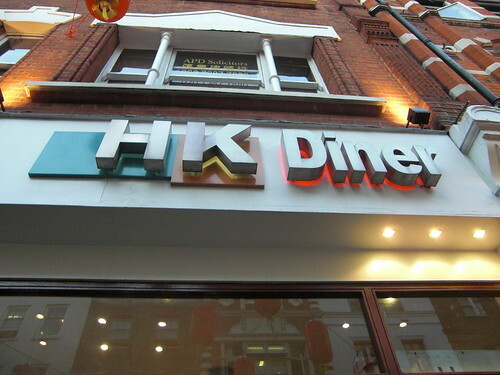 Used to eat at HK Diner after a hard night out clubbing (think it was only HK Diner or 1997open at these times) until the manager got very shirty with my admittedly very drunk friend. 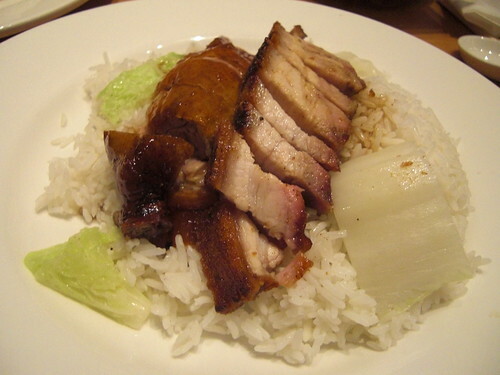 Out of curiousity, where do you rate the best roast duck and pork in London at the moment?